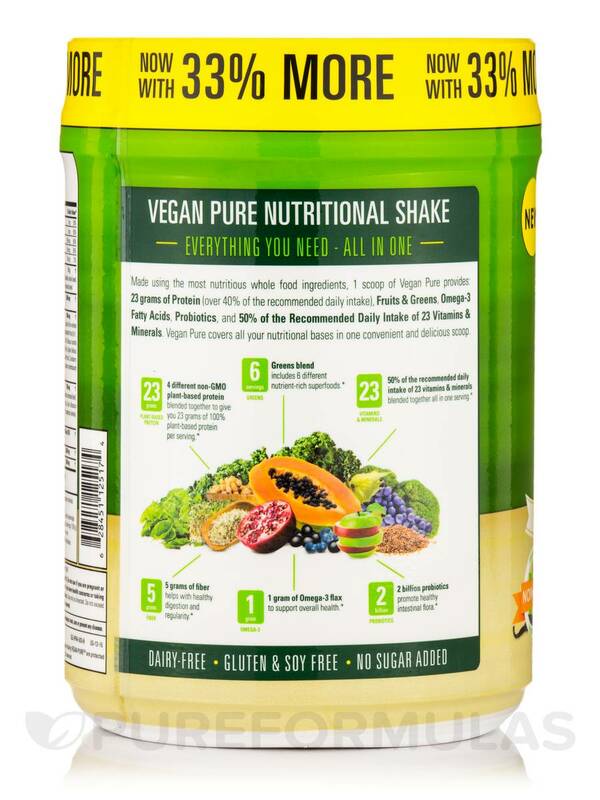 Vegan Pure is a delicious Whole Food Shake made up of the most nutrient rich‚ live and easily digested ingredients to give your body the vitamins and minerals it needs to perform at its peak. 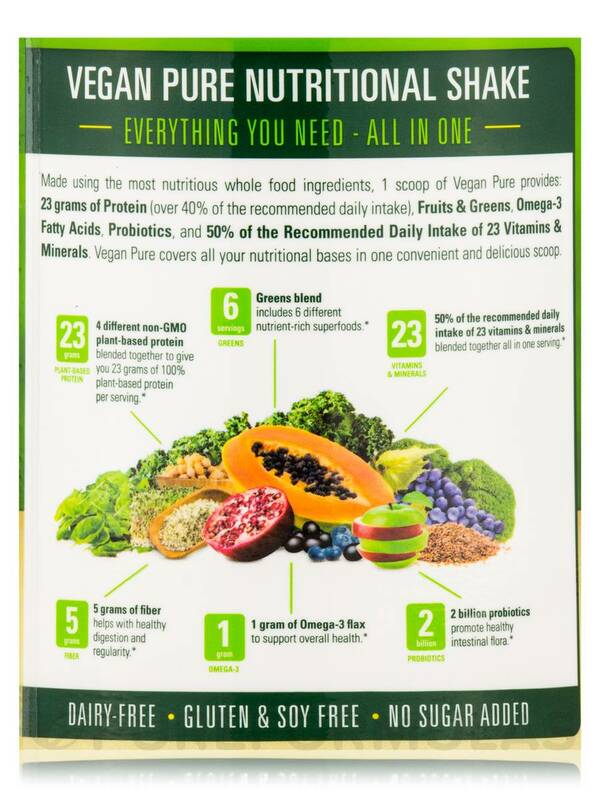 Take comfort in knowing that 1 Serving of Vegan Pure will provide you with 50% of your recommended daily intake of vitamins and minerals. Pea protein (pisum sativum) (seed)‚ hemp protein (cannabis sativa) (seed)‚ rice protein (oryza sativa) (seed)‚ chia protein (salvia hispanica) (seed). 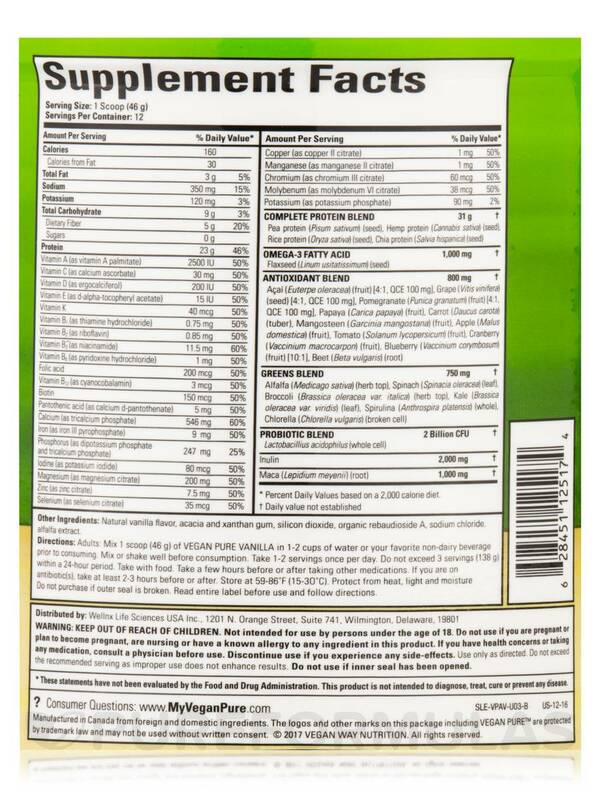 Other Ingredients: Natural vanilla flavor‚ acacia and xanthan gum‚ silicon dioxide‚ organic rebaudioside A‚ sodium chloride‚ alfalfa extract. 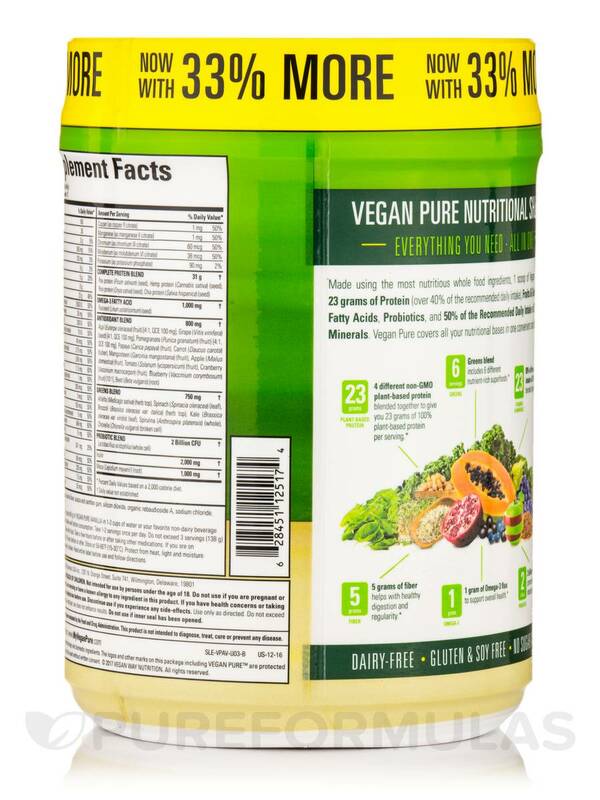 Dairy-Free / Gluten-Free / Soy-Free / No Sugar Added / Made with Non-GMO Ingredients / Vegan / Vegetarian. 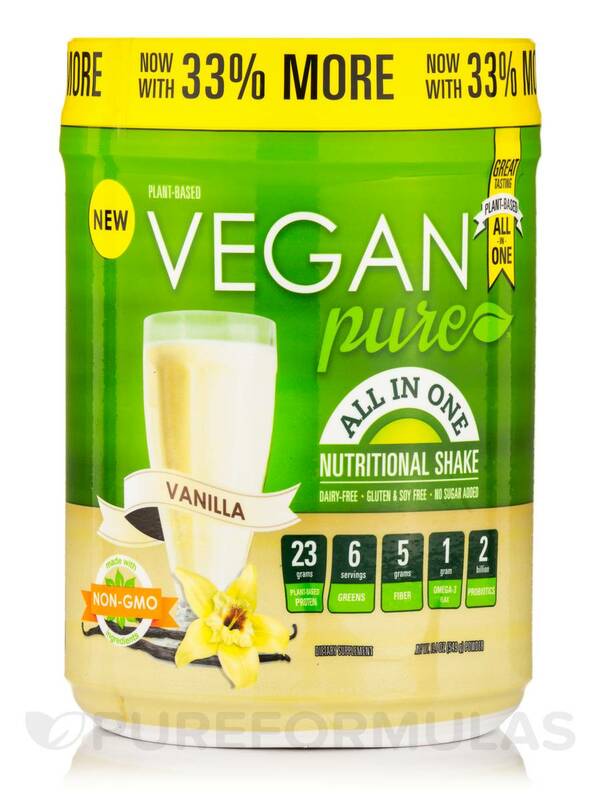 Adults: Mix 1 scoop (46 Grams) of vegan pure vanilla in 1-2 cups of water or your favorite non-dairy beverage prior to consuming. Mix or shake well before consumption. Take 1-2 servings once per day. Take with food. Take a few hours before or after taking other medications. If you are on antibiotics‚ take at least 2-3 hours before or after. Read entire label before use and follow directions. 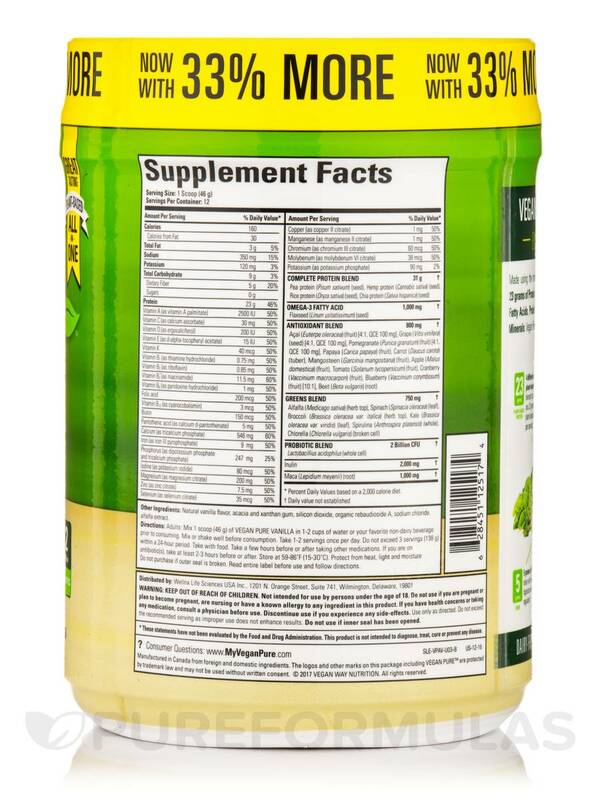 Do not exceed 3 servings (138 Grams) within a 24-hour period. Do not purchase if outer seal is broken. Do not use if inner seal has been opened. Do not use if you are pregnant or plan to become pregnant‚ are nursing or have a known allergy to any ingredient in this product. If you have health concerns or taking any medication‚ consult a physician before use. Discontinue use if you experience any side-effects. Do not exceed the recommended serving as improper use does not enhance results.